LUCKNOW:The Uttar Pradesh Police, already in focus for serial encounters in the state, has a new assignment at hand. Now, cops have been entrusted the job to ensure safety of cattle, going by the Yogi government’s detailed advisory on gaushalas on Monday. The advisory also states cow shelters need to be turned into economically selfsufficient models by marketing dung and urine for use in fertilisers and other products. Officials have been asked to assess the possibility of making cow dung mandatory at crematoriums and brick kilns. Also, to make the model viable, plans are afoot to replace plastic pots with dung pots and set up gobar gas plants. “To ensure safety of cattle in shelters, police stations should be made responsible,” the animal husbandry department advisory said. Employing a local chowkidar on additional salary can also be considered while a committee headed by the district magistrate will appoint locals to feed cattle, collect cow dung, milk cattle and clean the shelter. It also details a procedure to dispose carcasses and ensure autopsy if bovines died under “suspicious” circumstances. A campaign should be conducted in rural areas to encourage people to adopt stray cattle, the advisory states. 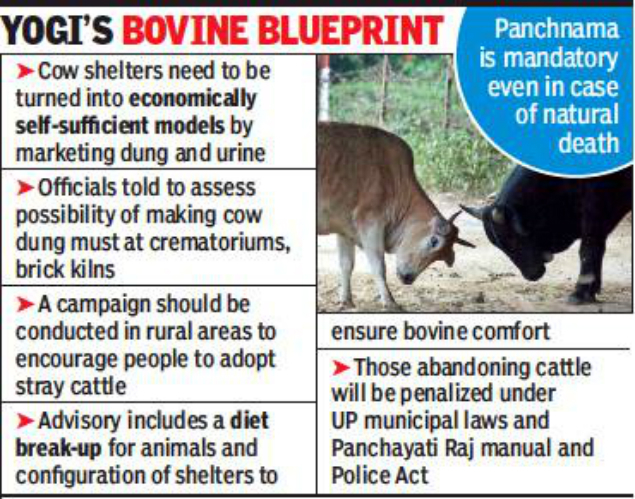 With stray cattle wreaking havoc in both rural and urban areas, the BJP-led government for whom cow welfare is a priority, has issued directions to construct temporary cow shelters in every municipal ward and gram panchayat. Since January, the administrative machinery has embarked on a drive to round up stray cattle and take it to shelters.